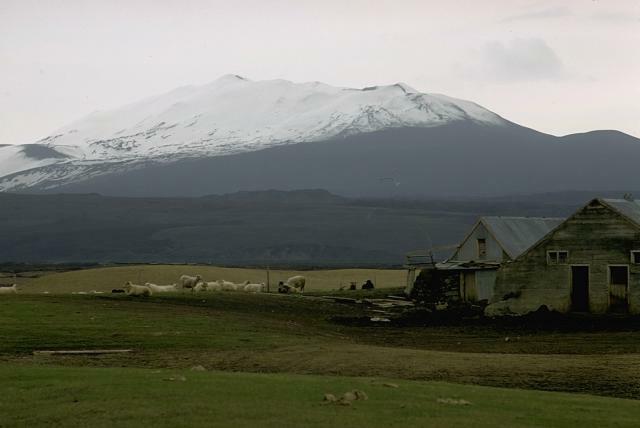 On 29 March the Icelandic Meteorological Office noted that Hekla had been quiet the previous few days; no additional earthquakes had been detected since a period of increased seismicity during 10-26 March. The Icelandic Civil Defense continued to maintain a level of "uncertainty". Introduction. This Bulletin report covers the unusual seismic activity recorded at Hekla from early March through April 2013. The last Bulletin report (BGVN 25:06) on Hekla clarified errors concerning NASA's airborne plume experiments on 29 February 2000, which occurred during Hekla's last eruption. Several references have been included to provide more information on Hekla's most recent eruptions in 1991 and 2000. Below are also two maps showing Hekla's location and lava flows created during some of Hekla's eruptions (figures 2 and 3). Figure 2. Map highlighting Hekla's location in Iceland. Hekla is located at the juncture where the E volcanic zone, a propagating rift, meets the South Iceland seismic zone, a transform fault. Source: Gudmundsson and others (1992). Figure 3. Map highlighting lava flows created through Hekla's past eruptions. The map also identifies GPS stations (triangles) and tilt sites (square) used to monitor Hekla. Some stations are operated by the Icelandic Meteorological Office (IMO) and others are operated by Penn State University in collaboration with IMO. The yellow lines represent Hekla's fissure, Heklugjá. Map was on found on University of Iceland's Institute of Earth Sciences website; credit to Sigrún Hreinsdóttir. March 2013. On 10 March 2013, the Icelandic Meteorological Office (IMO) began detecting micro-earthquakes at Hekla. The IMO detected at least 7 high-frequency earthquakes whose magnitudes ranged from 0.4-1. The earthquakes were recorded over a small area approximately 4.5 km to the NE of Hekla's summit with a source 11-12 km below the surface. The earthquakes were judged as the result of brittle fracture rather than a consequence of magma moving. It is important to note a clustering of earthquakes such as these is uncommon during non-eruption periods at Hekla. The IMO informed the National Commissioner of the Icelandic Police (NCIP) of the occurrence of these earthquakes. This type of activity had not been seen since Hekla's last eruption. With this information the NCIP and the Police Commissioner at Hvolsvöllur declared an 'uncertainty phase', which is the lowest of three warning level regarding natural hazards. The IMO also changed the Aviation Colour Code from Green to Yellow. The Aviation Colour Code is a 5-level color code scale that informs the aviation community of a volcano's status. The 5 levels in order of increasing volcanic activity are Grey, Green, Yellow, Orange and Red. According the IMO website, the Yellow color code signifies that a "volcano is experiencing signs of elevated unrest above known background levels or, after a change from [a] higher alert level…"
On 28 March, no seismic activity was detected at Hekla for ~4 days. No obvious signs of an imminent eruption were reported. Nevertheless, the 'uncertainty phase' warning level was kept in effect and the Aviation Colour Code remained Yellow. For the last few days of March 2013, no new activity was reported. April 2013. For the first three days of April, Hekla remained quiet, but the 'uncertainty phase' warning level remained in effect. On 4 April, the IMO changed the Aviation Colour Code from Yellow to Green. No changes in gas or heat were observed at Hekla's summit and no crustal movement was detected. Due to the low activity, the 'uncertainty phase' warning level was removed. 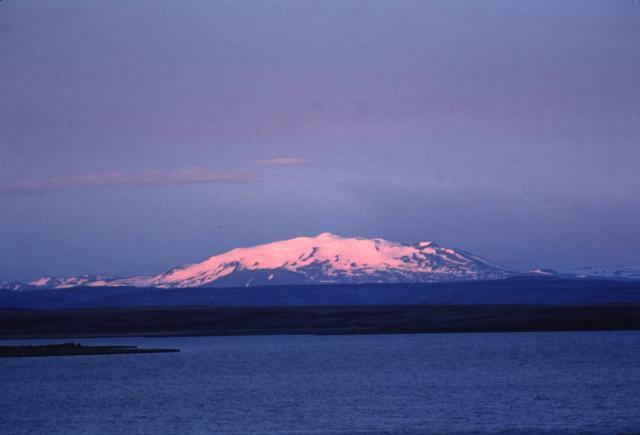 Hekla continued to be quiet until 26 April, when an M 1.1 earthquake occurred in the same area as the earthquakes in March. No other activity was reported at Hekla for the rest of April. Information Contacts: Icelandic Meteorological Office, Bustadavegur 7-9, 108 Reykjavík, Iceland (URL: http://en.vedur.is/); National Commissioner of the Icelandic Police (NCIP), Civil Protection and Emergency Management Department, Skúlagata 21, 101 Reykjavík, Iceland (URL: http://www.almannavarnir.is/displayer.asp?cat_id=133); and Sigrún Hreinsdóttir, GNS Science, PO Box 30368 1 Fairway Drive, Lower Hutt, 5010 New Zealand (URL: http://www.gns.cri.nz/). The Icelandic Meteorological Office noted that since 10 March, at least seven micro-earthquakes at Hekla, ranging in size from M 0.4 to 1, had been detected within a small area about 4.5 km NE of the summit, at depths of 11-12 km. These earthquakes were high-frequency, suggestive of brittle fracturing rather than magma movement. At Hekla, such a clustering of earthquakes is unusual in between eruptions. Continuous measurements of borehole strain and ground-based GPS showed no changes in crustal deformation. On 26 March the Icelandic Meteorological Office increased the Aviation Colour Code from Green to Yellow, because of the increased seismic activity. Icelandic Civil Defense together with the Police in Hvolsvöllur had also declared a level of uncertainty for Hekla, although there were no observable signs that an eruption of Hekla was imminent. The following telephone report from Hiynur Sigtryggsson of the Icelandic Weather Bureau was relayed . . . by Paul Bauer. "At approximately 1800 EDT (2200 GMT) on 5 May 1970, the volcano Hekla blew up and is now in eruption." The following report from the National Research Council of Iceland was relayed . . . by Jules Friedman. "There is an eruption from the fracture system controlling Hekla. There are two outflow centers active at the present time, one is said to be N of Hekla, the other S of Hekla. Aparently short cross fractures across the main Hekla fracture system are involved. There was, at least yesterday (5 May) and possibly continuing today, an eruption cloud. According to reports here in Washington last night, the eruption cloud deterred light aircraft and prevented any more detailed observation. In a sector N of the volcano, there was a tephra fall, tephra used in lieu of ash to indicate different size fragments. The wind sector is pointed N so that this is the area affected by the ash fall, and some farms were being evacuated." The following report from the Iceland Defense Force was passed to the Center by Commander Bolst. "Reporting from the Commander Iceland Defense Force. Time of the report is 061140 Zulu of May 1970. Due unfavorable weather and danger from flying rock and pumice cloud, P3B aircraft, volcano reconnaissance flight, was directed to remain outside of ten miles with minimum altitude of 10,000 feet. Nevertheless, crew managed to observe the eruption area for about 20 minutes before weather closed in entirely. Apparently there are seven fissure vents along the southeastern slopes of Mount Hekla proper. These had emitted an estimated 4 square miles lava flow. An eighth vent was observed on the NW slope, the peak itself obscured by clouds and smoke. About four miles, bearing 070° from peak, five additional fissures also violently emitting fire and rock but no lava. Latter are not associated with peak or any existing crater but are on relatively flat lava plain. All 13 vents and fissures were emitting fire to an altitude of 500-1,000 feet, and dense ash and smoke were observed to 29,000 feet. Local reports indicate pumice fall and lava flow now subsiding. As area is relatively sparsely settled, Icelanders have accomplished the required evacuation and have situation in hand." The following cable was received from S. Thorarinsson on 7 May. "Inspection Hekla area reveals eruption not in Hekla proper but separate fissure eruptions with very high fountains N, SW, and S of Hekla." The following cables were received from H. Sigtryggsson. "Seismic activity recorded Reykjavik began at [2058 on 4 May] with irregular tremors generally increasing until [2200 on 5 May] but subsiding considerably after  and virtually disappearing around midnight. Several earthquakes recorded, first one at [2058 on 5 May] largest at [2140, M 4] last earthquake at [0203 on 6 May]. No seismic activity observed since. Eruption activity first observed [2133 on 5 May] explosive at first with moderate pumice production depth of pumice layer close to 8 cm, 15 km from volcano. Explosive activity decreased after midnight and lava flow became predominant. Eruption cloud initially reached height of about 15 km, initial cloud drifted NNW. Moderate lava flow has reached length of about 2 km. Nuees ardentes not observed. No activity has been observed at the main crater of Hekla, activity mainly confined crater groups about two kilometers to NE of summit crater. present activity mainly lava production with slight pumice production." "Further information on Hekla eruption. Lava eruption continues with slightly diminished intensity. Sickness of livestock possibly due to effects of volcanic ash or other effects of the eruption have been reported at some farms near the volcano." A flank eruption of Hekla occurred shortly after 2100 local time on 5 May. The erupting fissures were at oblique angles from the main Hekla fissure system running very nearly N to S (12° to the E). Initial lava fountaining reached heights of 700-800 m within three hours after the eruption began. The most violent vents were on the SE side of Hekla, four fissures erupted. The first fissure is located on the W flank 2,500 m from the summit and 150 m in length. The second fissure is located 3,000 m to the N of the summit with a length of 400 m at an elevation of 400 m. The third and fourth fissures are located on the SW flank; one at an elevation of 800 m and the other at an elevation of 700 m. They have lengths of 50 m and 700 m respectively. There was some change in lava composition during the first two days. The first ash produced by the eruption contained 8.65% Fe2O3, and the first lava contained 9.3% Fe2O3. Stronium was 310-350 in the same sequence. Ten square kilometers of surface area were covered by lava during the first 24 hours of the eruption. After the second day the surface area covered by lava has not substantially increased but the thickness of the lava has increased. Total volume of lava is estimated to be 0.5 km3 by 12 May. Total volume of tephra is estimated to be 0.2 km3 by the same date. Seventeen cm deep ash was recorded 10 km from the volcano's summit on the axis of the ash fall. One-half cm deep ash was recorded 300 km from the volcano summit. Local groundwater is measuring high amounts of flourine, which is toxic to sheep and horses. Fluorine concentration in creek water has been measured at 10 mg per liter. Eruption cloud recorded on radar reached a height of 53,000 feet on 5 May. By 12 May the S and W craters had come to a complete stop. The W vent stopped on 7 May. The S vent stopped on 9-10 May. The N crater continues activity at a considerably reduced level. The following cable was received from Dr. Sigurdur Thorarinsson on 22 May 1970. "At 2240 on 20 May, a 1 km length fissure opened up one km further N of northern crater of Hekla volcano. The new fissure direction is NE-SW with 20 fountains playing. Lava flow considerable." Card 0933 (07 May 1970)Icelandic Weather Bureau via Paul Bauer, American University, Washington, D.C. USA; National Research Council of Iceland via Jules D. Friedman, U.S. Geological Survey. Card 0934 (07 May 1970)Commander, Iceland Defense Force via Lt. Cmdr. Bolst, U.S. Navy, Norfolk, Virginia, USA; S. Thorarinsson, Icelandic Museum of Natural History. Card 0936 (11 May 1970)Hlynur Sigtryggsson, Icelandic Weather Bureau, Vedurstofa Islands, Reykjavik, Iceland. Card 0940 (14 May 1970)S. Thorarinsson, Icelandic Museum of Natural History; G.E. Sigvaldason, Science Institute, University of Iceland. Card 0944 (22 May 1970)S. Thorarinsson, Icelandic Museum of Natural History. The eruption came to what is likely to be a definite end during the night between 3-4 July. In the areas in North Iceland most seriously affected by fluorine poisoning, so much of the fluorine has been washed away from the ash that the grazing grounds are regarded as tolerably safe for grazing. Information Contacts: Sigurdur Thorarinsson, Science Institute, University of Iceland. The eruption commenced at 2123 ± 2 minutes on 5 May 1970, and lasted until 5 July, or exactly two months. The real Hekla fissure, which splits the Hekla ridge lengthwise, did not open up this time except in its extreme SW. The main eruption was from fissures at the base of the Hekla ridge to the SSW (Sudurgigar), and NE (Hlidargigar). The eruption in the Sudurgigar began at an elevation of about 800 m above sea level. The elevation of the highest Hlidargigar, where eruption began about an hour later than in Sudurgigar, is about 640 m. During the first phase of the eruption, the eruption cloud reached 15,000 m height. The main tephra fall lasted about two hours, during which time the tephra production averaged 10,000 m3/sec. The total volume of the tephra produced was about 70 million m3. The bulk of the tephra came from the Sudurgigar crater row SSE of the Hekla ridge. The tephra was carried NNW and reached the north coast of Iceland, 90 km from Hekla, in 2.5 hours. The tephra sector within the 0.1 cm isopach covers 6,950 km2 on land, but altogether there was some tephra fall over an area of about 40,000 km2. The tephra, which had an SiO2 content of 54-55%, was strongly polluted by fluorine, the fluorine content of the freshly fallen tephra being 800-2,000 ppm. About 1,500 ewes and 6,000 lambs were killed by fluorine poisoning. The production of lava during the first hours averaged about 800 m3/sec. The flow from Sudurgigar ceased on 10 May, and in the Hlidargigar craters NE of the mountain on 20 May, but on the same day a new fissure 0.9 km long opened up 1 km to the north of Hlidargigar. From this fissure lava flowed incessantly until 5 July. A row of craters, now known as Oldugigar, was built up on this fissure. The highest one is about 100 m. The eruption fissures in the Sjkolkviar area are arranged en echelon, and so are seemingly the Sudurgigar eruption fissures. The total area of the 1970 lava is 18.5 km2. The lava from the Sudurgigar covers 6.5 km2, lava on the SW slopes of Hekla 2.1 km2, and the lava from the Hlidargigar and Oldugigar crater rows 9.9 km2. (Hlidargigar lava 5.8 km2, Oldugigar lava 6.6 km2, of which 2.5 km2 covered Hlidargigar lava). The total volume of the 1970 Hekla lava is about 0.2 km3. The new Hekla lava is andesitic, containing a little olivine, and in chemical composition and texture similar to the lava produced during the last months of the 1947-48 eruption. The outer structure is typical aa lava. The chemical composition of the lava justifies the view that the 1970 eruption should be classified as a Hekla eruption, although the fissure which splits the Hekla ridge lengthwise took very little part in it. "Hekla started erupting at 1328 on 17 August. Small earthquakes were recorded on local seismographs for 20-25 minutes prior to the first explosions but these precursors were not noticed until later. "This was a mixed eruption starting in the summit area and quickly extending to the full fissure length of 7 km, longer than observed in the 1947 and 1970 eruptions. The initial activity at 1320 was a steam column, then a dark tephra column started between 1327 and 1330. The main tephra fall lasted about 2 hours and extended NNE, and the eruption column reached about 15 km altitude. The maximum tephra thickness 10 km N of the summit was 20 cm, and at the N coast, about 230 km distant, 1 mm or less. The fluorine content in many grazing districts is above danger level, causing problems for livestock, especially sheep. Lava began flowing shortly after the beginning of the eruption. The first flows appeared near the summit, then lava eruption extended to the lower parts of the fissure. Most of the lava issued within 12 hours and nearly all within 24 hours, forming four main separate lava flows, covering an area of about 22 km2. The volume of the lava is estimated at about 0.1 km2 and the tephra somewhat less than in the 1970 eruption, which produced 0.07 km3. "Glowing scoria was last observed in the early morning of 20 August. Steam emission was continuing as of late August. For the first few days following the eruption this steam column was often darkened at the base, but no glow was observed. "Preliminary chemical analyses of tephra and lava show composition similar to that of the 1970 eruption products. The last Hekla eruption took place 5 May-5 July 1970, making this period of quiescence of only 10 years the shortest recorded for Hekla since 1104. The shortest previous period between eruptions was 1206-22 and the second shortest was between the 1947 and 1970 eruptions. If the present eruption episode is over now, the behavior is highly unusual. All previous known eruptions have lasted from 2 months to 2 years. Initially there have been a few days of major activity, followed by a few almost quiet days, then renewed explosive activity and lava eruption concentrated on small parts of the fissure." Information Contacts: K. Grönvold, Nordic Volcanological Institute (NVI); S. Thorarinsson, Univ. of Iceland. An eruption of Hekla was first observed about 0300 on 9 April. The initial activity consisted of ejection of ash columns. Pilots said that ash reached 4.2 km altitude and radar registered the top of an eruption column at 6.6 km above sea level. Ash was blown N, toward the interior of Iceland, falling at least 30 km from the volcano. Lava extrusion from a newly formed summit crater began later on 9 April, reached a peak during the afternoon, then declined gradually until the eruption ended on 16 April. Three flows were extruded, the two largest moving down the N side of the main Hekla ridge, the smallest down the S side. The lava covered an area of 5-6 km2 and extended a maximum of 4.5 km from the crater, reaching the base of Hekla Ridge on both the N and S sides. After the initial ash ejection, activity was dominantly effusive, but a small amount of ash fell E and NE of the volcano later in the eruption. The area has remained inaccessible, but ash amounts were estimated to be only a few millimeters thick. No earthquakes were recorded prior to the eruption, and distinct harmonic tremor did not appear on seismic records until after the eruption began. Volcanologists interpreted the April activity as a continuation of the much larger eruption of August 1980. Further Reference. Grönvold, K., Larsen, G., Einarsson, P., Thorarinsson, S., and others, 1983, The Hekla eruption of 1980-1981: BV, v. 46, p. 349-364. Information Contacts: K. Gronvold, NVI; S. Thorarinsson, Univ. of Iceland. The COSPEC detected SO2 N and SW of Hekla's April 1981 lava flows. Information Contacts: K. Grönvold; NVI; R. Stoiber and S. Williams, Dartmouth College. Images from the Meteosat geostationary satellite showed a plume extending NNE (azimuth 010°), over an uninhabited area, and by 2000 it was approaching the coast (more than 200 km from the volcano), where light ashfall was reported. 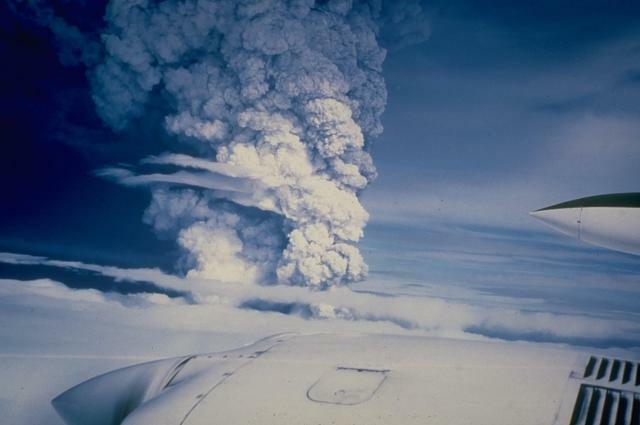 Feeding of the eruption cloud appeared to have stopped by 2000, and the plume was clearly detached from the volcano by 2100. At 2300, Meteosat images showed a second eruption cloud, which was again carried NNE and reached 300 km in length before dissipating by 0300. Weather clouds then prevented additional satellite observations. [During the early hours of the eruption, several fissures were active, including the southern part of the main Hekla fissure.] Numerous lava flows advanced W, E, and S, extending 4-5 km by midnight. Four flank vents were visible and glow could be seen from the summit area, obscured by clouds. Lava viscosity was relatively low, producing comparatively thin, fast-moving flows reminiscent of the 1980 eruption. [Tremor began to decrease at about 1800 and by 0400 the next morning was already down to a relatively low level. Since then it has been slowly decreasing, with occasional short-term increases. On the second day of the eruption, activity was already more or less restricted to a single fissure on the lower southern flank, trending SE from the top of the volcano. One crater on this fissure was still active as of 8 February. Slight activity could be seen in another fissure on the S side of the volcano until 20 January, but with very little lava flow and no fountains. Hekla, one of the most active volcanoes in Iceland, is near the intersection of the Eastern Volcanic Zone and the transform zone of S Iceland. Although near a zone of spreading, it is not a typical rift volcano. Its products are intermediate to acid in composition. The last two repose periods (1970-80 and 1981-91) are the shortest in Hekla's known history, since 1104. Hekla's previous eruption began on 17 August 1980 and produced about 120 x 106 m3 of lava and 60 x 106 m3 of tephra before activity stopped on 20 August. The eruption resumed on 9 April 1981, extruding another 30 x 106 m3 of lava in the succeeding week; [these two episodes are usually regarded as a single eruption] (Grönvold and others, 1983). Reference. 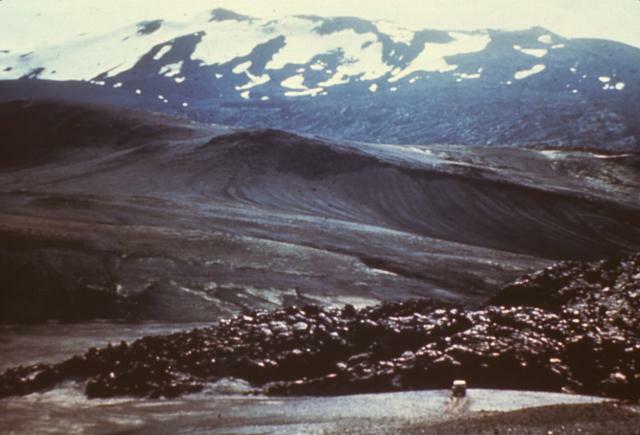 Grönvold, K., Larsen, G., Einarsson, P., Thorarinsson, S., and Saemundsson, K., 1983, The Hekla eruption 1980-1981: BV, v. 46, p. 349-363. Information Contacts: P. Einarsson and S. Björnsson, Univ of Iceland; [A. Gudmunsson and]E. Tryggvason, NVI; O. Karst and J. Paquette, NOAA. "The eruption that started on 17 January (15:12 and 16:1) lasted until 11 March, or nearly 53 days. The eruption produced mainly basaltic andesite lava, with a total area of about 23 km2. Its thickness is as little as 2 m on the steepest slopes of the volcano but exceeds 10 m on flat ground. The estimated average thickness is 6-7 m and the volume of lava is 0.15 km3. The volume of freshly fallen tephra is estimated as roughly 0.02 km3 but negligible when calculated as dense lava. Consequently, 0.15 km3 may be regarded as the total volume produced during this eruption. The lava and tephra are basaltic andesites, almost identical in composition to those produced in the eruptions of 1970 and 1980-81. "Changes in the volcanic tremor, as well as field observations, indicate that the main eruption occurred from 1700 on 17 January to about 0400 on 18 January. During this period the effusion rate may have attained 2,000 m3/s, but the average production of lava during the first 40 hours of the eruption was ~800 m3/s. After attaining its peak on the first day, the effusion rate decreased rapidly to ~10 m3/s. The rate then decreased slowly during the next three weeks to a temporary minimum of ~1 m3/s on 9 February. The effusion rate increased again on 14 February and was ~10 m3/s on 16 February. The rate decreased to ~3 m3/s on 24 February, to ~1 m3/s on 6 March, and then remained similar until the end of the eruption." Further Reference. Gudmundsson, A., Oskarsson, N., Grönvold, K., Saemundsson, K., Sigurdsson, O., Stefansson, R., Gislason, S., Einarsson, P., Brandsdottir, B., Larsen, G., Johannesson, H., and Thordarson, T., 1992, The 1991 eruption of Hekla, Iceland: BV, v. 54, p. 238-246. Information Contacts: A. Gudmundsson, NVI. 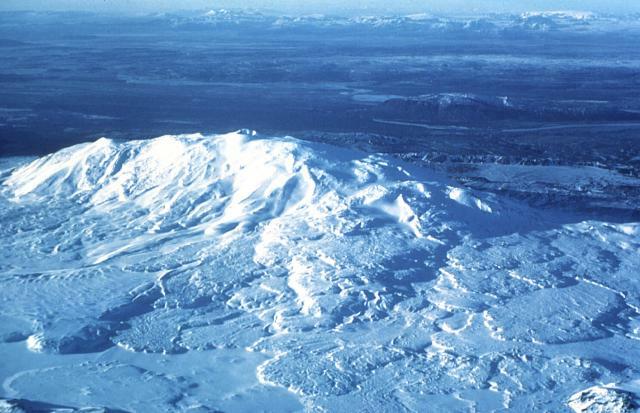 On 26 February 2000 the WSW-trending, elongated Hekla volcano erupted. A fissure 6-7 km long opened along the SW flank of the Hekla ridge, from which a discontinuous curtain of lava erupted starting at 1819. Just a few minutes later, at 1825, an ash plume reached a height of 11 km and was carried N by light winds. Based on the tremor amplitude the eruption reached peak intensity in the first hour of activity, then gradually declined. Seismic networks maintained by the Science Institute at the University of Iceland and the Icelandic Meteorological Office recorded short-term precursors. Small earthquakes were first detected by seismographs at various locations during 1655-1707. These gradually increased and the first well-located earthquakes (M 1-2) started at 1729, centered 1-2 km SE of the summit at depths of a few kilometers. A network of borehole strainmeters operated by the Meteorological Office also detected precursory changes associated with magma movements. A decrease in strain build-up rate, signaling a release of magma pressure, was recorded by a strainmeter in a borehole ~15 km from the summit at 1817. Notice was given to the National Civil Defense and the Civil Aviation Administration about 40 minutes before the eruption, and the public was alerted about the imminent eruption about 15 minutes before it began through national radio broadcasts. Continuous low-frequency tremor began at 1819, at the same time the eruptive cloud was spotted. Ashfall was reported on 26 February from Grimsey Island, ~70 km off the N coast of Iceland and 300 km N of Hekla. Although small amounts of ash fell in inhabited areas of N Iceland, most fell in uninhabited areas of the island's interior. Seven hours after the eruption's onset the ash deposit 21 km N had a maximum thickness of 4-5 cm. Lava flows on 27 February covered a large part of the SE flank. That evening a lava stream flowed N from the erupting fissure at a rate of several meters per hour. Another more active lava stream emanated from three craters near the S end of the fissure; the stream was several kilometers long and advancing at ~1 m/minute. On 28 February an eruption cloud was deflected towards the S by northerly winds. However weather conditions precluded direct observations. Tremor amplitude continued to slowly decline, and the strength of the eruption was decreasing (figure 1). Two eruption clouds were seen at 0500, confirming that activity was ongoing. Although the craters were not visible in the daylight, the most active crater just S of the summit produced three lava streams down the S flanks. Activity in the N declined during the day on 28 February. At 0630 one lava flow had reached the Vatnafjoll mountains at Lambafell, 5 km S of the summit. Advancing at ~2-3 m/hour, the lava front was estimated to be 8-10 m wide. That evening observers watched Strombolian activity in three craters at the southernmost part of the fissure. Figure 1. Tremor at Hekla during 26-28 February 2000 recorded at Haukadalur, 10 km W. At the beginning of the eruption, 1819 on 26 February, the tremor increased rapidly and reached a maximum at 1850. Tremor then decreased until about 0700 on 27 February and became steady. The tremor was approximately 10 % of the maximum value, on 28 February, but over 10 times greater than the normal value. Courtesy of Páll Halldórsson, Science Institute at the University of Iceland. Ashfall was reported on the morning of 29 February 35-40 km S in Fljótshlíð. At 0500 volcanic tremor had started to increase and continued until 1000-1100. By about 0800 all activity in the summit had ceased. During the afternoon of 29 February activity at the southernmost end of the fissure increased again, producing eruption clouds ascending above the summit. In the darkness of the evening, three craters at the southernmost end of the fissure produced lava flowing SW. People watching the lava on the NE flanks reported that they could walk on the stopped flow there. Vigorous Strombolian eruptions and lava flows on the fissure that cuts the SW slopes were seen during a reconnaissance flight on 1 March during 1100-1230. Four main vents and three smaller vents produced explosions at intervals of 4-5 minutes. At the base of the fissure a large tumuli had developed. The lava streams coming out through the opening of the tumuli joined a stream coming from overflows of the uppermost craters. The S-directed lava flows were fed by the crater closest to the summit. The lava field in the S had only advanced ~100 m since 28 February, but on 1 March it was growing toward the E. By 1 March lava had covered approximately 17 km2. Increased activity was observed in the upper craters on 2 March, although bad weather persisted from 1200 on 1 March until midday on 3 March. There was also constant steaming from the SW craters, and, compared to 1 March, much larger steam clouds rising from the upper craters. At nightfall explosions were observed at ~30-minute intervals. Glowing lava streams were noted on the flank of the mountain on 2 March. On 3 March a group of scientists reached the SW lava flow at 1300 and found that the lava front was ~10 m wide and advancing very slowly, ~1-2 m/day. While tracing the lava to the W the group noted that at some places the flow was spreading much faster, up to ~1 m/hour. Following the lava flow along its W side, the group reached its origin at the foot of the volcano, where it emerged from the end of the erupting fissure. At the origin, the estimated flow rate was 0.06 m/s, producing about 10 m3/s of lava. Due to the continuous degassing along the lava stream a blue mist was formed. The blue mist was also observed farther E along the flank of the volcano, indicating that lava was still flowing from the crater close to the summit area. The craters in this region fed the lava flow that moved S toward the Vatnafjoll glacier 10 km SE from Hekla. Later in the evening observers reported that lava was still flowing slowly towards Vatnafjoll. Explosive activity in the uppermost crater of the SW-fissure was characterized by small explosions at 10-20 minute intervals that produced white steam clouds with only trace amounts of ash. Due to bad weather conditions on 4 March, no direct observations could be made of the eruption. Decreasing eruption tremor was detected. On 5 March the lava flow to the SW was still ongoing according to observations made in the afternoon. At sunset, a red pulsing glow was observed in the uppermost craters of the SW-fissure from the town of Selsundsfjall, 15 km SW. Small eruption clouds were observed on 6 March penetrating the weather clouds covering the summit of Hekla. During a reconnaissance flight between 1730 and 1830 on 6 March the whole fissure was steaming vigorously and all of the lava flows appeared to have stopped. The lava stream in the SW had left behind an empty channel. Neither incandescence nor explosive activity were observed from the craters. Minor tremors continued on 6-7 March, but may have been related to lava degassing in the feeder dike. At 0844 on 8 March the last eruptive tremor was detected on seismometers. Based on the end of detectable tremor, and with no signs of new eruptive products since 5 March, it was determined that the eruption ended on the morning of 8 March. Lava covered approximately 18 km2; the preliminary estimate of lava production was 0.11 km3. Plume investigation. Sulfur dioxide (SO2) contained in plumes from Hekla was detected by the Earth Probe TOMS (Total Ozone Mapping Spectrometer) instrument. TOMS imagery at 1154 on 27 February showed that the volcanic cloud was a narrow plume arcing from the volcano in southern Iceland, then N to Greenland, and finally E towards Norway. The plume primarily contained SO2 because almost all of the ash fell out locally. On 28 February the TOMS imagery indicated that plume stretched out over the Barents Sea and possibly into eastern Russia. By 29 February the SO2 cloud had drifted E in a band along the Norwegian and Russian coasts of the Barents Sea. During a transit flight on 28 February a SOLVE (SAGE III Ozone Loss and Validation Experiment) mission with an instrument-laden DC-8 aircraft flew through the plume shortly after the eruption ~11.3 km NNE of Iceland at 76°N and 5°W, just off the Greenland coastline. The plume extended up to ~13 km altitude, well into the lower stratosphere. Instruments also measured many in situ trace gases, SO2, HNO3, NO, NOy, O3, and aerosols (volatile and non-volatile), including their size distribution. From about 0508 until 0518 on 29 February the SOLVE aircraft again entered the volcanic cloud. The scientific team reported large enhancements in CN, NOy, HNO3, CO, and particle counts, ozone went to nearly zero, H2O jumped up, and there were strong scattering layers up to 13 km. The plume was a very impressive, orange, airfoil-shaped feature in the pre-dawn sky. The DC-8 engines needed an oil change and new filters after passing through the plume. A flight on 5 March detected enhanced aerosols and SO2 at 1301, but by that time the plume was so diluted that it represented no danger to the aircraft. During the three weeks following the initial encounter the DC-8 detected remnants of the plume trapped within the polar vortex. The resulting analysis concluded that volatile aerosols increased and the sizes of non-volatile large aerosols decreased. Fluoride analysis. Ash from previous Hekla eruptions has often been the cause of fluorosis in grazing animals. However, during this time of the year most domestic animals are kept indoors, so fluorosis is not expected to become a problem. Freshly fallen ash was measured for soluble fluoride ions (F-). The result was 800-900 mg F/kg. Snow melted by the ash contained about 2,200 mg/l (ppm) of fluoride. Information Contacts: Freysteinn Sigmundsson, Nordic Volcanological Institute, Grensásvegur 50, IS-108 Reykjavik, Iceland (URL: http://nordvulk.hi.is); Páll Einarsson, Science Institute, University of Iceland, Hofsvallagata 53, IS-107 Reykjavík, Iceland; Ragnar Stefánsson, Icelandic Meteorological Office, Bustadavegur 9, 150 Reykjavík, Iceland (URL: http://www.vedur.is/); Mark Schoeberl, Code 910, NASA/GSFC, Greenbelt, MD, 20771 USA; Michael Fromm, Computational Physics, Inc., 2750 Prosperity Ave., Suite 600, Fairfax, VA 22031 USA (URL: http://cloud1.arc.nasa.gov/solve/); Arlin Krueger, Code 916, NASA/GSFC, Greenbelt, MD, 20771 USA. "For approximately seven minutes starting at 0510 during a transit flight on 29 February to Kiruna, Sweden, a NASA DC-8 aircraft with a payload of SOLVE (SAGE III Ozone Loss and Validation Experiment) sensors flew through the plume ~11.3 km NNE of Iceland at 76 °N and 5 °W, just off the Greenland coastline. The plume extended up to ~13 km altitude, well into the lower stratosphere. The aircraft passed thorough the volcanic ash far N and W, and at a flight level much higher, than the predictions reported by the Volcanic Ash Advisory Center (VAAC), London. Instruments measured many in situ trace gases, SO2, HNO3, NO, NOy, O3, volatile and non-volatile aerosols, and aerosol size distribution. The scientific team reported substantial increases in CN, NOy, HNO3, CO, and particle counts, O3 went to nearly zero, H2O increased, and strong scattering layers up to 13 km were detected. "A flight on 5 March detected enhanced aerosols and SO2 at 1301, but by that time the plume was so diluted that it represented no danger to the aircraft. During the three weeks following the initial encounter the DC-8 detected remnants of the plume trapped within the polar vortex. The resulting analysis concluded that volatile aerosols increased and the sizes of non-volatile large aerosols decreased." NASA-DFRC also advised that the statement about the plume being a "very impressive, orange, airfoil-shaped feature in the pre-dawn sky" was erroneous. Post-flight interviews with the pilot indicated that there was no moon out, therefore pitch black sky conditions existed at the time of the encounter. The pilots had no visual evidence of flying into the plume. Information Contacts: Gary Shelton, NASA, Dryden Flight Research Center, P.O. Box 273, Edwards, CA 93523-0273 USA. One of Iceland's most prominent and active volcanoes, Hekla lies near the southern end of the eastern rift zone. Hekla occupies a rift-transform junction, and has produced basaltic andesites, in contrast to the tholeiitic basalts typical of Icelandic rift zone volcanoes. Vatnafjöll, a 40-km-long, 9-km-wide group of basaltic fissures and crater rows immediately SE of Hekla forms a part of the Hekla-Vatnafjöll volcanic system. A 5.5-km-long fissure, Heklugjá, cuts across the 1491-m-high Hekla volcano and is often active along its full length during major eruptions. Repeated eruptions along this rift, which is oblique to most rifting structures in the eastern volcanic zone, are responsible for Hekla's elongated ENE-WSW profile. Frequent large silicic explosive eruptions during historical time have deposited tephra throughout Iceland, providing valuable time markers used to date eruptions from other Icelandic volcanoes. Hekla tephras are generally rich in fluorine and are consequently very hazardous to grazing animals. Extensive lava flows from historical eruptions, which date back to 1104 CE, cover much of the volcano's flanks. Baldridge W S, McGretchin T R, Frey F A, 1973. Magmatic evolution of Heckla, Iceland. Contr Mineral Petr, 42: 245-258. Gudmundsson M T, Larsen G, Hoskuldsson A, Gylfason A G, 2008. Volcanic hazards in Iceland. Jokull, 58: 251-268. Hoskuldsson A, Oskarsson N, Pedersen R, Gronvold K, Vogfjord K, Olafsdottir R, 2007. The millennium eruption of Hekla in February 2000. Bull Volcanol, 70: 169-182. Johannesson H, Jakobsson S P, Saemundsson K, 1982. Geological map of Iceland, sheet 6, south Iceland. Icelandic Museum Nat Hist & Iceland Geodetic Surv, 1:250,000 geol map, 2nd edition. Lacasse C, Karlsdottir S, Larsen G, Soosalu H, Rose W I, Ernst G G J, 2004. Weather radar observations of the Hekla 2000 eruption cloud, Iceland. Bull Volcanol, 66: 457-473. Larsen G, Eriksson J, 2008. Holocene tephra archives and tephrochronology in Iceland - a brief overview. Jokull, 58: 229-250. Larsen G, Thorarinsson S, 1977. H4 and other acid Hekla tephra layers. Jokull, 27: 1-19. Sigmarsson O, Condomines M, Fourcade S, 1992. A detailed Th, Sr and O isotope study of Hekla: differentiation processes in an Icelandic Volcano. Contr Mineral Petr, 112: 20-34. Soosalu H, Einarsson P, 2004. Seismic constraints on magma chambers at Hekla and Torfajokull volcanoes, Iceland. Bull Volcanol, 66: 276-286. Soosalu H, Einarsson P, 1997. Seismicity around the Hekla and Torfajokull volcanoes, Iceland, during a volcanically quiet period, 1991-1995. Bull Volcanol, 59: 36-48. Soosalu H, Einarsson P, 2002. Earthquake activity related to the 1991 eruption of the Hekla volcano, Iceland. Bull Volcanol, 63: 536-544. Soosalu H, Einarsson P, Jakobsdottir S, 2003. Volcanic tremor related to the 1991 eruption of the Hekla volcano, Iceland. Bull Volcanol, 65: 562-577. Soosalu H, Einarsson P, Thorbjarnadottir B S, 2005. Seismic activity related to the 2000 eruption of the Hekla volcano, Iceland. Bull Volcanol, 68: 21-36. Thorarinsson S, 1967. The Eruptions of Hekla in Historical Times. Reykjavik: Societas Scientiarum Islandica, p 1-183. Thorarinsson S, Sigvaldason G E, 1972. The Hekla eruption of 1970. Bull Volcanol, 36: 269-288. Tryggvason E, 1994. Observed ground deformation at Hekla, Iceland prior to and during the eruptions of 1970, 1980-81 and 1991. J. Volcanol. Geotherm. Res., 61: 281-291. Vilmundardottir E G, Hjartarson A, 1985. Pumice flows during Hekla eruptions. Natturufraedingurinn, 54: 17-30 (in Icelandic with English summary). There is data available for 65 Holocene eruptive periods. There is data available for 6 deformation periods. Expand each entry for additional details. Remarks: Tilt and InSAR measurements show that Hekla subsided during the 2000 eruption. 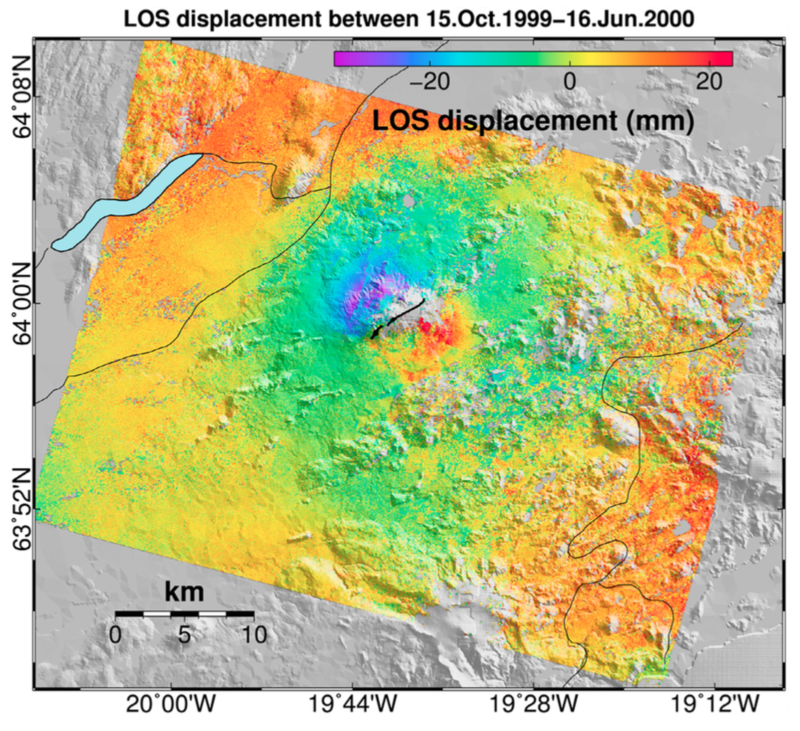 LOS coeruptive displacements between 15 October 1999 and 16 June 2000 from descending track 52. A broad area around the volcano is characterized by displacement away from satellite, about 15?20 mm relative to the surroundings. The local deformation signal that straddles the summit is due to the formation of the 2000 eruptive fissure (black line on the summit) and is superimposed on widespread coeruptive LOS deflation. From: Ofeigsson et al. 2011. Reference List: Sturkell et al. 2006; Ofeigsson et al. 2011. Sturkell, E., F. Sigmundsson, and R. Slunga,, 2006. 1983-2003 decaying rate of deflation at Askja caldera: Pressure decrease in an extensive magma plumbing system at a spreading plate boundary. Bull. Volc., 68, 727-735. Remarks: Tilt and InSAR measurements show that Hekla uplifted following the 2000 eruption. 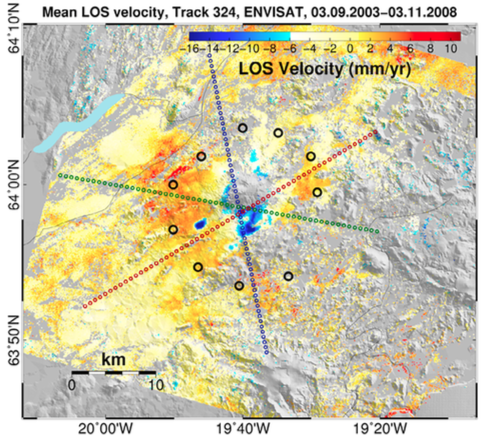 Mean LOS velocities after the 2000 eruption. Deformation associated with the 2000 eruption is not included. (c) Track 324, descending orbit covering the time interval after the 2000 eruption. The lines of colored dots correspond to the profiles shown in Figure 6. The black circles, aligned around the summit approximately where the highest LOS shortening is observed, are locations used in Figure 7. The deformation around Hekla is torus?like, with uplift rates peaking around 6 km from the summit and then decreasing toward the summit and becoming subsidence. A second center of subsidence is observed east of Hekla, at Torfajo?kull. A minus sign on the scale bar represents lengthening of LOS range. Remarks: Thermally contracting lava flows are subsiding. Mean LOS velocity proximal to Hekla from ERS track 52 with outlines of recent lava flows. Dark green outlines the 1980 lava field, bright green outlines the 1981 lava field, and blue outlines the 1991 lava field. Some of the LOS lengthening correlates with the recent lava flows. Reference List: Ofeigsson et al. 2011. Remarks: Tilt measurements show that Hekla subsided during the 1991 eruption. Reference List: Sturkell et al. 2006. Remarks: Tilt and InSAR measurements show that Hekla uplifted following the 1991 eruption. 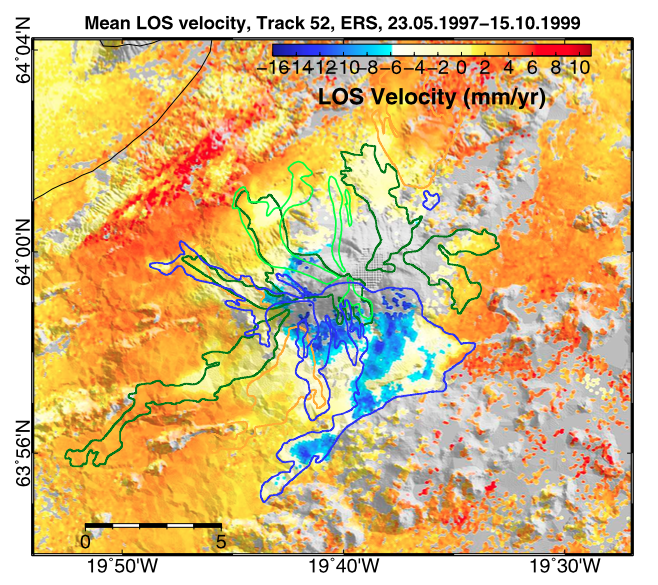 Mean LOS velocities before the 2000 eruption. Deformation associated with the 2000 eruption is not included. (a) Track 52, descending orbit. (b) Track 359, ascending orbit. The lines of colored dots correspond to the profiles shown in Figure 6. The black circles, aligned around the summit approximately where the highest LOS shortening is observed, are locations used in Figure 7. The deformation around Hekla is torus?like, with uplift rates peaking around 6 km from the summit and then decreasing toward the summit and becoming subsidence. A second center of subsidence is observed east of Hekla, at Torfajo?kull. A minus sign on the scale bar represents lengthening of LOS range. 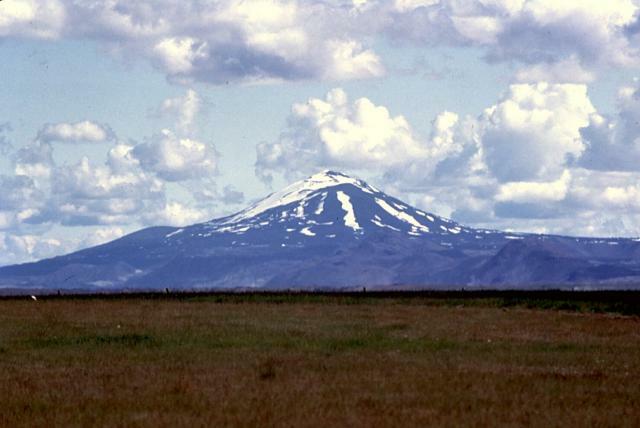 Remarks: Tilt measurements show that Hekla uplifted prior to the 1991 eruption. 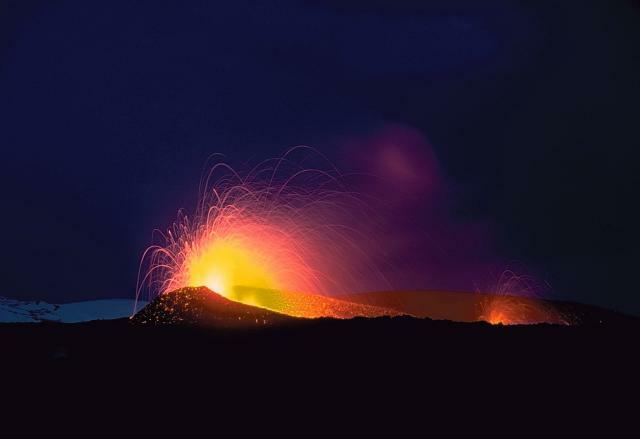 Strombolian eruptions color the nighttime sky on the flank of Hekla volcano in May 1970. This eruptive fissure, on the northern flank at about 650-m altitude, was one of three principal areas of eruptive activity during 1970. The Oldugigar vent, seen here, was, along with the nearby Hlidagigar vent, the source of the most voluminous lava flows of the 1970 eruption. The lava flows traveled 6 km to the north over uninhabited land. Photo by Robert Citron, 1970 (courtesy of William Melson, Smithsonian Institution). 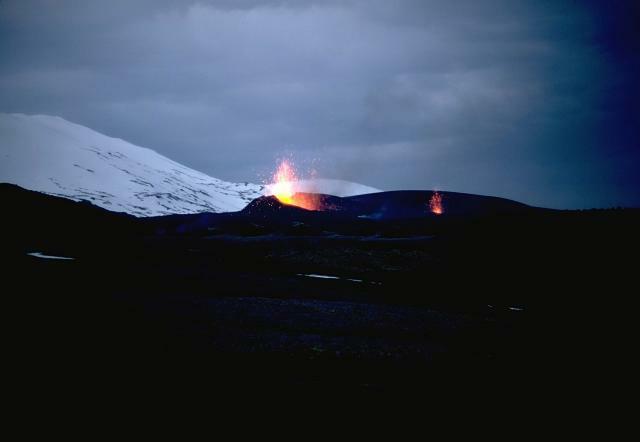 On May 5, 1970, fissures opened on the south, SSW, and NE flanks of Hekla. An eruption plume reached 15-km high, and lava fountaining fed lava flows that traveled to the SW, WNW, and north. Two eruptive fissures were active on the NE flank, seen here; these produced lava flows that traveled 6 km to the north. Fluorine poisoning from tephra fall caused major livestock mortality, killing 1500 ewes and about 6000 lambs. The north-flank lava flow remained active until July 5. Incandescent bombs are ejected from the Oldugigar vent on the north flank of Hekla volcano in May 1970. The 1970 eruption began with vigorous explosive activity and was followed by effusion of lava flows that traveled to the SW, WNW, and north. The eruption lasted until July 1970. One of Iceland's most prominent and active volcanoes, Hekla played a prominent role in late Middle Ages mythology as the abode of the condemned. Repeated eruptions along an ENE-WSW-trending fissure, seen here from a farm east of the volcano, give Hekla an elongated profile. Frequent large explosive eruptions during historical time have deposited tephra throughout Iceland, providing valuable time markers used to date eruptions from other Icelandic volcanoes. A powerful eruption column rises above a cloud layer over Hekla volcano on August 17, 1980. Explosive eruptions from a 7-km-long fissure produced 15-km-high eruption columns. During the next three days, lava flows issued from nearly the full length of the fissure and produced six flows that traveled primarily to the north and NW, but also to a maximum distance of 8 km on the SE side. Photo courtesy of Gudmundar Sigvaldason (Nordic Volcanological Institute), 1980. Volcanologists observe the incandescent front of a steaming, blocky lava flow that is advancing from Hekla volcano during a brief three-day-long eruption beginning on August 17, 1980. Lava flows issued from nearly the full length of a 5.5-km-long fissure that runs along Hekla's summit ridge. 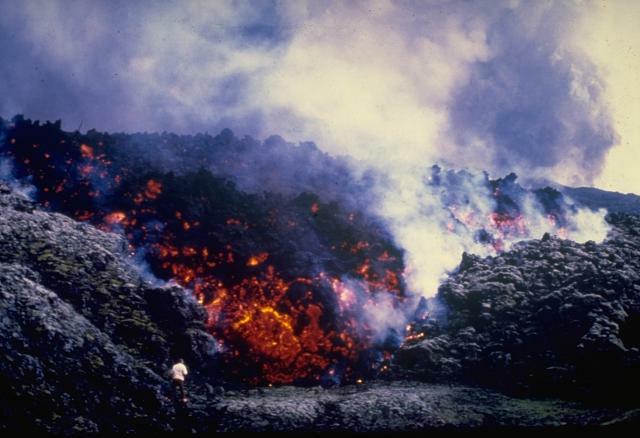 The 1980 eruption produced six basaltic-andesite lava flows that traveled primarily to the north and NW, but also reached a maximum distance of 8 km on the SE side. The elongated summit ridge of Hekla volcano is seen here from the west with a fresh, historical lava flow in the foreground. Repeated eruptions along this rift are responsible for Hekla's elongated ENE-WSW profile. A 5.5-km-long fissure, Heklugja, cuts across the 1491-m-high volcano and is often active along its full length during major eruptions. Photo courtesy of Jules Friedman (U.S. Geological Survey). 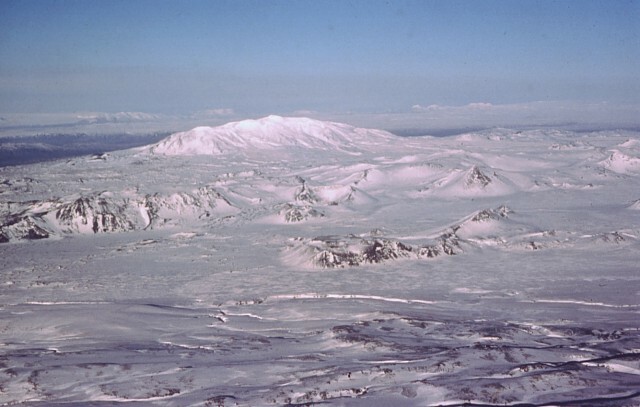 Snow-covered Hekla, one of Iceland's most prominent and active volcanoes, is seen here in an aerial view from the east. Toppgigur crater occupies the summit and Axlargigur crater forms a knob along the summit ridge to the left. Repeated eruptions along an ENE-WSW-trending rift are responsible for Hekla's elongated profile. The 5.5-km-long Heklugja fissure cuts across the volcano and is often active along its full length during major eruptions. Lava flows from Hekla's historical eruptions, which date back to 1104 CE, cover much of the volcano's flanks. Hekla has a conical profile when viewed from the SW, looking directly down the axis of the elongated, fissure-fed volcano. Axlargigur, the WSW end of the 5.5-km-long Heklugja fissure that crosses the elongated summit of Hekla, extends toward the camera. This fissure was active along its entire length during the 1970 eruption. Photo by Bill Rose, 1980 (Michigan Technological University). 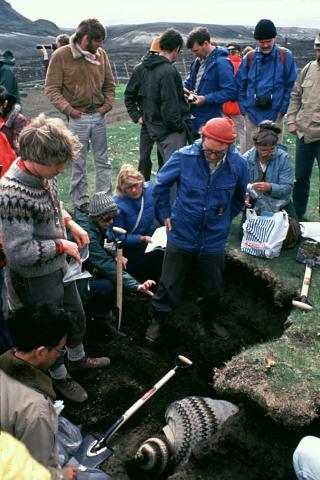 Eminent Icelandic volcanologist Sigurdur Thorarinsson (right center, with red cap) leads an international group of volcanologists on a field trip to Icelandic volcanoes. Thorarinsson, standing here in a pit excavated to reveal ash layers, pioneered the technique of tephrochronology, in which widespread tephra layers (volcanic ash) are used to date eruptions. Thorarinsson's detailed studies of tephra layers from Hekla volcano demonstrated the utility of determining the relative ages of ash layers by their stratigraphic position between dated ash horizons. Twilight colors shade the snow-capped slopes of Hekla, one of Iceland's most active volcanoes. Hekla's elongated profile is apparent in this view from the south of the 5.5-km-long summit ridge. The Heklugjá fissure is often active along its full length during historical eruptions. The Vatnafjöll volcanic system, cutting across the center of the image, is a 40-km-long, 9-km-wide chain of alkali basaltic fissures and crater rows located south of the more prominent Hekla volcano (center horizon). Volcanism at Vatnafjöll, part of the Hekla/Vatnafjöll volcanic system, has migrated from the SW to the NE during the early to late Holocene. 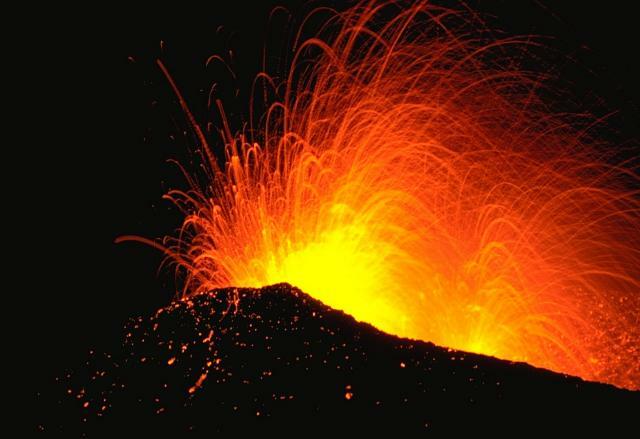 More than two dozen fissure eruptions have occurred during the Holocene, most recently about 1200 years ago. The Global Volcanism Program has no maps available for Hekla. The following 58 samples associated with this volcano can be found in the Smithsonian's NMNH Department of Mineral Sciences collections, and may be availble for research (contact the Rock and Ore Collections Manager). Catalog number links will open a window with more information. Catalogue of Icelandic Volcanoes (Link to Hekla) The Catalogue of Icelandic Volcanoes is an interactive, web-based tool, containing information on volcanic systems that belong to the active volcanic zones of Iceland. It is a collaboration of the Icelandic Meteorological Office (the state volcano observatory), the Institute of Earth Sciences at the University of Iceland, and the Civil Protection Department of the National Commissioner of the Iceland Police, with contributions from a large number of specialists in Iceland and elsewhere. This official publication is intended to serve as an accurate and up-to-date source of information about active volcanoes in Iceland and their characteristics. The Catalogue forms a part of an integrated volcanic risk assessment project in Iceland GOSVÁ (commenced in 2012), as well as being part of the effort of FUTUREVOLC (2012-2016) on establishing an Icelandic volcano supersite. Large Eruptions of Hekla Information about large Quaternary eruptions (VEI >= 4) is cataloged in the Large Magnitude Explosive Volcanic Eruptions (LaMEVE) database of the Volcano Global Risk Identification and Analysis Project (VOGRIPA).